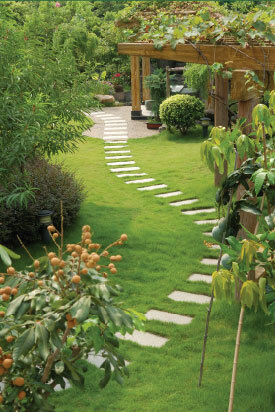 A garden that looks good; is practical and easy to maintain; enhances your property and provides years of enjoyment. That's a D&G Garden World garden..
D&G Garden World is a specialist garden landscaping company serving the Essex and east London area. D&G provides a complete, professional garden landscaping service as well as supplying and laying turf, grass and topsoil and providing and fitting quality fencing. D&G also provide a garden equipment hire service for those customers who prefer to carry out their own garden makeover. D&G Garden World offers a reliable and responsive service with experience and expertise built up over 20 years. All garden work is performed by professional garden experts who are fully trained and insured. D&G's garden experts are friendly and approachable. All work is carried out with complete customer satisfaction in mind: not just during the job but also on completion and long afterwards. Before giving a detailed, written quotation, D&G offer a free consultation and give you expert advice on the suitability of your ideas for your garden design. D&G want to help you create a beautiful garden, but realise the importance of making sure any on-going maintenance is within your capabilities. You can trust D&G to give you honest, straightforward advice on your garden project, whatever it may be. D&G Garden World guarantees that all their garden products and materials are sourced from the very best suppliers ensuring the highest quality and longest lifespan of all plants and shrubs. D&G Garden World offers a comprehensive range of garden services together with free estimates and a delivery and collection service in and around the Essex and east London areas. Please Contact Us to arrange your free quotation and consultation. We look forward to helping you with your garden landscaping, turfing and fencing needs.